This past Saturday was a beautiful day. With little pressing errands to do, I decided to head out to one of the local Minneapolis area breweries to get some root beer. 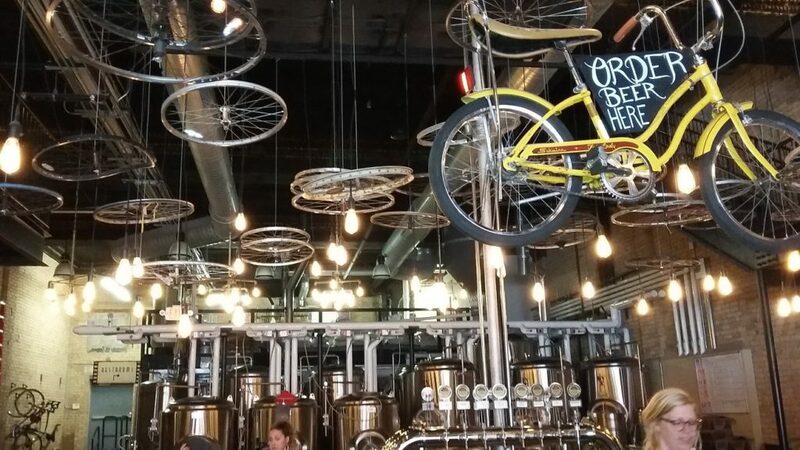 I chose LynLake Brewery because it seemed to be in biking distance, only an hour and 20 minutes each way, or 28 miles round trip, which is actually further then I’ve ever biked before in a single day. But as I said the weather was wonderful and I figured why not. It turned out to be a perfect day for a ride and there was beautiful scenery everywhere and lots of lakes and things and yeah, Minneapolis is a pretty city on a bike. And then it turns out the LynLake Brewery, in Uptown, is actually all bike themed on the inside (pictures below) and a stop on some Minneapolis bike brewery tours, so it really was the correct mode of transportation. After a bit of repose and a glass of water I set down to business. The Body isn’t overly sweet, but has a nice sassafras core and some creamy vanilla accented by a lot of spice. There’s a little too much brown sugar as well giving that fruity sort of flavor that too much brown sugar does. The Bite is sharp and spicy with a lot of cinnamon coming through and good carbonation. It’s a little on the harsh side though it does finish smooth. The head is tall and foamy. The Aftertaste is vanilla with some of that brown sugar fruitiness. Brown sugar, much like licorice, is a difficult ingredient to work with in root beer. Add just the right amount and your creation can be divine, add too much, and a strange fruity type mess. This brew took the brown sugar just a little too far, at least for my tastes. The Bite is a little to harsh as well. Don’t get me wrong, this is still a quality brew, but I just can’t give it my Seal. The LynLake Brewery. See all the bike stuff?